Hierarchically porous ZnO films are synthesized through a novel sol–gel method using triethylenetetramine (TETA) as a stabilizer. Highly crystalline hierarchical porous ZnO thin films with different pore sizes are synthesized in various reaction mediums by altering solvents, sol concentration, the molar ratio of TETA to zinc acetate dehydrate (ZAD), and withdrawal speed. FESEM images show the formation of a hierarchical porous film with spherical and agglomerated particles in the optimized condition of ethanol as the solvent, sol concentration of 0.2 M, the molar ratio of [TETA]:[ZAD] = 2, and withdrawal speed of 30 mm/min. Increasing the solvent chain length, increasing the sol concentration, decreasing the TETA content, or increasing the withdrawal speed increases the particle size and porosity. XRD data, UV–Vis, and PL spectroscopy indicate high crystallinity with appropriate optical properties for the optimized sample. The hierarchical porous ZnO film synthesized by this method can be utilized as a photoelectrochemical electrode in devices such as photocatalysis and photoelectrochemical water splitting. Porous materials exhibit good properties due to the large surface area and high surface to volume ratio, which make them the best promising materials for potential use in many new applications such as solar cells [1, 2, 3], photocatalysts [4, 5, 6], water splitting [7, 8, 9], gas sensors [10, 11, 12, 13], and supercapacitors [14, 15, 16]. Attractive hierarchically porous systems can overcome the problem existed in meso- or nanoporous thin films due to the presence of large pores beside small pores, which the former facilitates the diffusion of ions or molecules through the porosity and the latter guarantees the promised surface area. The accessibility of pore openings improves the diffusivity of reactants as well as products within the film and enhances the availability of the internal surface . 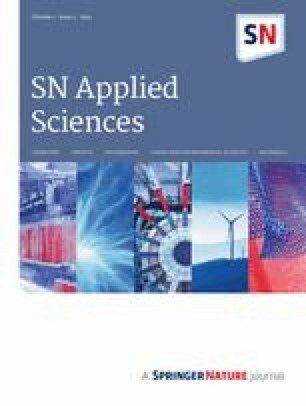 ZnO nanostructured materials have received considerable interest from researchers due to its wide energy band gap (3.37 eV), high exciton binding energy (60 meV), high transparency in visible and IR regions, and remarkable performance in optoelectronics [18, 19, 20] and photonics [21, 22, 23] devices. Up to now, various physical and chemical methods have been widely used for the preparation of ZnO hierarchical porous films such as hydrothermal [24, 25, 26], thermal decomposition of zinc hydroxide carbonate precursor [27, 28, 29], PEG template chemical route [30, 31, 32], electrophoretic deposition [33, 34], and template assisted sol–gel [35, 36, 37]. The most used method for obtaining porous structures is using of sacrificial templates, either hard or soft templates. After the removal of templates by calcination or dissolution, the desired porous interiors are generated. Huang et al. reported on hierarchically three-dimensional porous ZnO architectures synthesized by a template-free, aqueous solution method combined with subsequent calcination. Wang et al. synthesized porous hierarchical ZnO nanostructured films via a simple low-temperature hydrothermal method and reported their applications as photoanodes in DSSCs. Xingfu et al. reported ZnO nanosheets with hierarchically porous structures which are produced by a hydrothermal preparation and thermal decomposition of a layered precursor of zinc hydroxide carbonate. Xie et al. prepared porous ZnO hierarchical architectures from 2D porous single crystal nanosheets through annealing the zinc hydroxide carbonate [Zn5(CO3)2(OH)6] precursor. This structure exhibits superior sensing performance. Lei et al. fabricated hierarchical porous ZnO microspheres via a facile hydrothermal route followed by calcination, which possesses a potential for applications in adsorptive removal of organic wastewater pollutants. 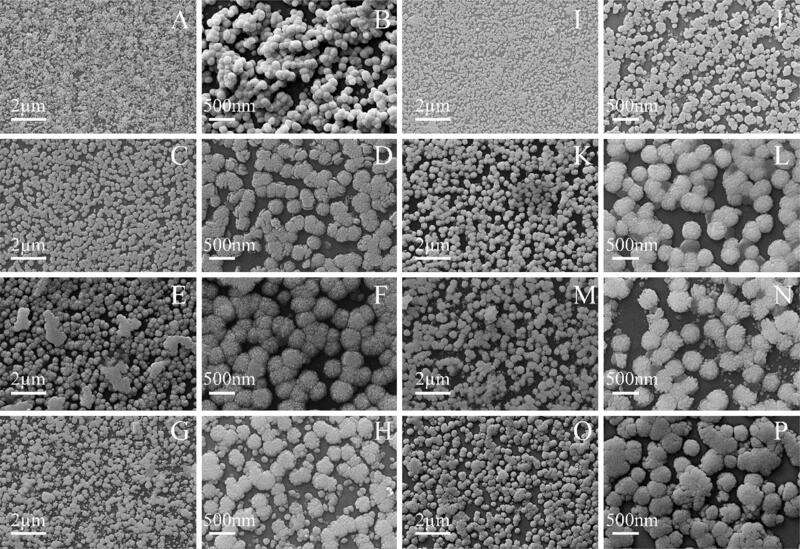 The as-prepared porous ZnO shows microsphere morphologies with diameters of 6–8 μm. Ma et al. synthesized ZnO surface-modified In2O3 nanomaterials by using a two-stage procedure of solvothermal method and sonochemical method, which indicate improved gas-sensing performance. Fang et al. used a capping agents-assisted hydrothermal method to produce ZnO hierarchical morphologies for the use in dye-sensitized solar cells. Zhang et al. reported 3D hierarchical ZnO porous flower synthesized through a novel membrane dispersion reactor with the direct precipitation method. Nevertheless, it is still a challenge to provide the different size of porosity at each scale to maximize the effectiveness of large pores and minimize the subsequent loss of surface area. Additionally, low-cost thin film processing techniques for the large-scale production of materials with necessary performance is highly required in industry. Although different amine stabilizers such as monoethanolamine, diethanolamine, triethanolamine, triethylamine, and ethylene diamine were used to synthesize ZnO thin films, they always lead to homogeneous dense films without any detectable porosity . In this paper, a new stabilizer of triethylenetetramine (TETA) has been developed in the sol–gel procedure for the novel design of ZnO thin films with controlled surface morphology and overall porosity. Besides, to the best our knowledge, no researches have been conducted to investigate the effects of TETA on the ZnO sol–gel behavior and the properties of the corresponding films. TETA is a unique amine with two end amine groups of type I and two amine groups of type II. Our strategy to control the shape and porosity of ZnO thin films consists of growing thin film materials without a template, from alcoholic sol by monitoring different parameters which alter the thermodynamics and kinetics of nucleation and growth of the materials. Such an approach is template free with no need of further modifications process, which produces ZnO thin film with novel morphology and, in particular, high porosity with different sizes of pores that are important for basic fundamental research as well as of relevance for various fields of industrial and high-tech applications. All chemical reagents used in this research were of analytical grade, purchased from Merck Company, and utilized without any purification. A zinc acetate dihydrate precursor (Zn(CH3COO)2·2H2O–ZAD) was used as a zinc source. Solvents used in this research are ethanol (CH3CH2OH—EtOH), 1-propanol (CH3CH2CH2OH—PrOH), and 1-butanol (CH3CH2CH2CH2OH—BuOH). In all samples, triethylenetetramine ([CH2NHCH2CH2NH2]2—TETA) was consumed as the stabilizer, which plays a key role in the formation of porosities. ZnO thin film was synthesized according to our previous work . Briefly, 0.439 g ZAD was dissolved in 10 mL solvent and stirred for 10 min at room temperature (solution is opaque in this step). Next, 0.298 mL TETA was added to the solution and remained under stirring for 30 min until the transparent and stable sol was achieved. Soda lime glasses were used as transparent substrates which were cleansed in bathes of distilled water and alcohol. As-prepared sol was used to produce 10-layer thin films via dip-coating (with different withdrawal speed = 30, 60, and 120 mm/min). After each deposition step, thin films were dried for 10 min at a temperature of 300 °C. Thin films were then calcined at 500 °C for an hour in the air after the deposition process. The parameters of solvent, sol concentration, TETA/ZAD molar ratio, and dip coating withdrawal speed are considered according to Table 1. In all samples, while one parameter was changed, the other parameters were held constant. X-ray diffraction (XRD) of ZnO thin films was obtained by Philips X-pert pro PW1730, using Cu-Kα radiation (λ = 1.5405 Å, 40 kV, 30 mA) in the range of 25°–65°. The morphology of the porous ZnO thin films were characterized by field emission scanning electron microscopy (FESEM) using a VEGA-TESCAN-XMU. 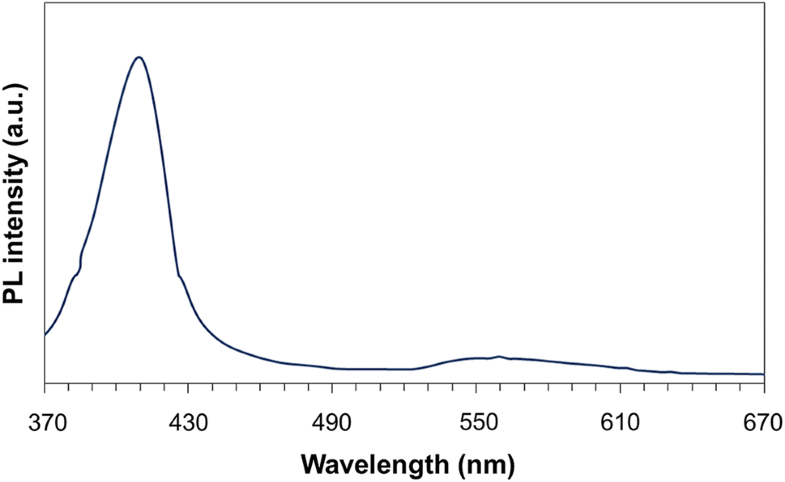 Photoluminescence spectrum was investigated in room temperature using Perkin Elmer LS-55 having Xenon as an excitation source. 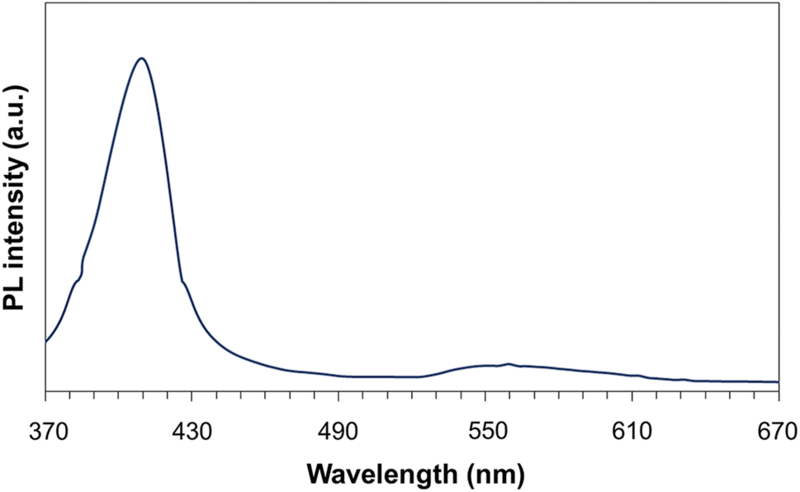 The UV–Vis spectrum was recorded in the range of 190–1100 nm by PG instrument T80+. TETA has various roles in ZnO sol–gel process such as solving ZAD precursor, controlling the reactions rate, and stabilizing the sol, and, above all, facilitating the formation of complexes, which promotes the formation of porous ZnO thin film. Chemical and physical properties of TETA such as polarity, reactivity, boiling point, and viscosity are owing to its molecular structure like organic chain type, length, and geometry of the molecule. These properties determine the behavior of amine in the sol–gel process, which lead to a significant effect on thin film morphology. Thus, the effects of different parameters and resulted microstructures are first discussed, and then TETA structure and reactions are explained. Various sols and dip coating conditions were studied to achieve the most suitable porous ZnO microstructure. The details of the optimizing process and possible reasons will be discussed in the following sections. EtOH, 1-PrOH, and 1-BuOH were considered in order to investigate the effects of solvent on the morphological architecture of ZnO porous thin film. Physical and chemical properties of selected solvents are summarized in Table 2. FESEM images of the films synthesized by these different solvents are represented in Fig. 1a–f. Although all of the films have a smooth, uniform, and porous morphology, the sample synthesized with EtOH (shown in Fig. 1a, b) enjoys smaller grain size, more homogenous and unique porous structure compared to the others. 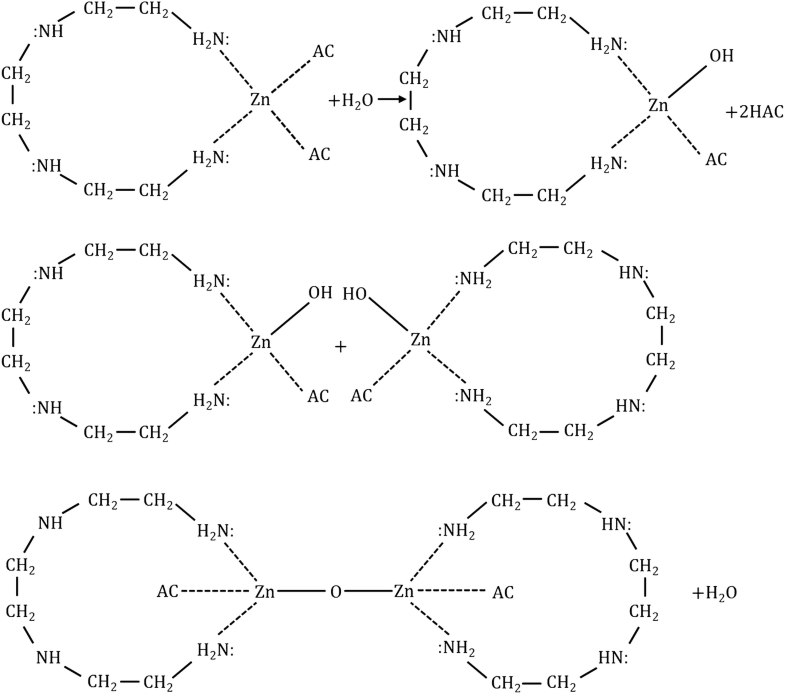 All the ZnO thin films show agglomerated and macroporous structure with a continuous framework consisting of an interconnected pore network throughout the structure (shown in Fig. 1a–f). The fabricated nanostructured films exhibit a pore size of around 100, 300, and 200 nm in EtOH, 1-BuOH, and 1-PrOH, respectively. Various reasons can be contributed in the formation of different morphological architectures by distinct solvents, the most important of which is the reaction media that has a significant impact on the speed and progress of sol–gel reactions . Reaction media can be altered by different parameters, including polarity, dielectric constant, and solvent evaporation. With this in mind, TETA can be dissolved in EtOH more than the other solvents because EtOH possesses stronger polarity in comparison with the other solvents, leading to form more efficient complexes such as zinc hydroxy double salt (Zn-HDS) and pyramidal zinc oxy-acetate (basic zinc acetate). During the next step, the deposition process, the nucleation rate of ZnO nanoparticle is higher thanks to the formation of more complexes in the sol, thus providing more available nucleation sites. On the contrary, whenever BuOH is used as a solvent, fewer complexes form in ZnO sol due to the improper dissolving of TETA caused by the weak polarity of BuOH during the previous stage, eventually lead to coarse nanoparticles. Finally, the ZnO nanoparticles size increases with longer chain length from EtOH to BuOH. Secondly, another reason worth considering as a key factor is a dielectric constant that is an electrostatic barrier against particle agglomeration. Since BuOH solvent possesses the lowest dielectric constant compared to EtOH and 1-PrOH (brought in Table 2), it results in severe agglomeration of ZnO nanoparticles followed by the formation of the largest particles in the film deposition process. Conversely, EtOH has such a high dielectric constant, which leads to fine ZnO nanoparticles formation. Thirdly, solvent evaporation is another effective factor in film formation which can alter morphology remarkably. Since the lowest boiling temperature between all the selected solvents belongs to EtOH as described in Table 2, the growth front of its film formation propagates faster given the fact that solvent can be evaporated faster and easier, which results in macroporosity morphology. In conclusion, during the growth of colloidal ZnO nanoparticles, the alcohols not only provide the medium for the reactions but also act as ligands to help control the morphology and particle size of ZnO. Hence, the solvent should be chosen carefully in order to achieve proper sol media and distinguished porous structure. In this research, EtOH shows the best porous structure and sol properties, so that it is selected as a solvent in the following steps. Apart from the main sol concentration (0.2 M), sol concentration of 0.1 M is used to investigate the effect of sol concentration on the ZnO morphology. It should be noted that higher concentration than 0.2 M results in a mediocre quality film. The FESEM images of the ZnO thin film with 0.1 M sol concentration are shown in Fig. 1g–h. It is clearly observed that the agglomerated grain size and pores, estimated from the micrographs, increase as the sol concentration changes from 0.2 to 0.1 M due to lessening the amount of solutes (i.e. zinc acetate and TETA) in the sol media, thus lowering the speed of sol–gel reactions—in this case, the effect of TETA amount is more obvious. By decreasing the amount of TETA, fewer complexes are formed in the same amount of solvent, which leads to macroporosity architecture. Additionally, increasing sol concentration may lead to the elevation of sol viscosity, which results in the hard removal of solvent and increment film thickness. As a result, in the case of 0.1 M concentration, a solvent evaporates easily due to the lower sol viscosity, so that less shrinkage occurs which leads to form a porous structure consisting of more large and heterogeneous distributed pores. Therefore, 0.2 M sol concentration provides both sol components and microstructure formation more properly so much so that it is selected for optimized sol concentration in the following stages. Three different molar ratios of 0.5, 1, and 2 were selected to determine the effect of molar ratio of TETA to ZAD on ZnO thin film morphology and porosity. Figure 1i–l present FESEM images of different molar ratios of TETA to ZAD. As it can be observed, whereas the molar ratio increases, ZnO nanoparticles and porosity sizes decrease on account of the fact that more complexes are formed in shorter time thanks to more available TETA stabilizer, causing higher nucleation rate of ZnO nanoparticles followed by finer ZnO nanoparticle and porous structure. On the other hand, the fast hydrolysis rate in low TETA content causes the formation of smaller nanoparticles. The ZnO grain size of various molar ratios of 0.5, 1, and 2 films are about 100, 450, and 150 nm, respectively. Since finer nanoparticles and smaller pores are required for further applications, the molar ratio of TETA to ZAD equal to 2 is chosen as the optimized parameter. Withdrawal speed is one of the most effective parameters on thin film structure. Therefore, three various withdrawal speeds of 30, 60, and 120 mm/min were used to synthesize ZnO thin films and the FESEM images are shown in Fig. 1m–p. Homogenous structure with unique porosity can be achieved by 30 mm/min withdrawal speed. The thickness of each layer decreases by increasing the dip coating speed and solvent can evaporate quickly, which causes more shrinkage and eventually ZnO film with inhomogeneous structure is formed. It can be mentioned that fast evaporation causes ZnO nanoparticles to not have sufficient time to form a uniform layer and extensive agglomerated ZnO nanoparticles are observed. As a morphological conclusion, the unique porous structure can be obtained by using the solvent of EtOH, sol concentration of 0.2 M, the molar ratio of TETA/ZAD equal to 2, and withdrawal speed of 30 mm/min. The main sample ZnO porous thin film, which possesses the most appropriate microstructure was analyzed by XRD. Figure 2 shows the XRD pattern of reference ZnO thin film that corresponds to six diffraction peaks of polycrystalline ZnO at (100), (002), (101), (102), (110) and (103) planes (JCPDS 36-1451). This result reveals that ZnO thin film has a hexagonal wurtzite structure and good crystallinity since all peaks are very sharp. In the XRD pattern of the obtained ZnO, no impurity peaks are observed. In polar solvents such as EtOH, there is a strong interaction between the polar (002) surface and solvent, promoting the rate of crystal growth perpendicular to this surface and resulting in the no preferential growth of the crystals. where α is the absorption coefficient, hυ is the photon energy, A is a constant, and Eg is the optical band gap. The band gap can be calculated by extrapolating the linear part of the (αhν)2 versus hυ curve to the horizontal axis. The interception shows the band gap value. Calculated band gap for ZnO porous main sample is about 3.32 eV which is in good agreement with the reported band gap of ZnO . The UV–Vis spectra of samples with 1-propanol and 1-buthanol, TETA/ZAD = 0.5 and 1, and withdrawal speed of 60 mm/min are also shown in Fig. 3a. As can be seen, there are no significant differences in UV–Vis behavior. The sample with 1-propanol solvent demonstrates slightly lower transmittance which could be due to scattering of light with large agglomerates in this sample. The samples with TETA:ZAD = 0.5 and withdrawal speed of 60 mm/min also exhibit slightly higher transmittance in visible region, which could be related to larger porosities in these samples, assisting more light transmission. 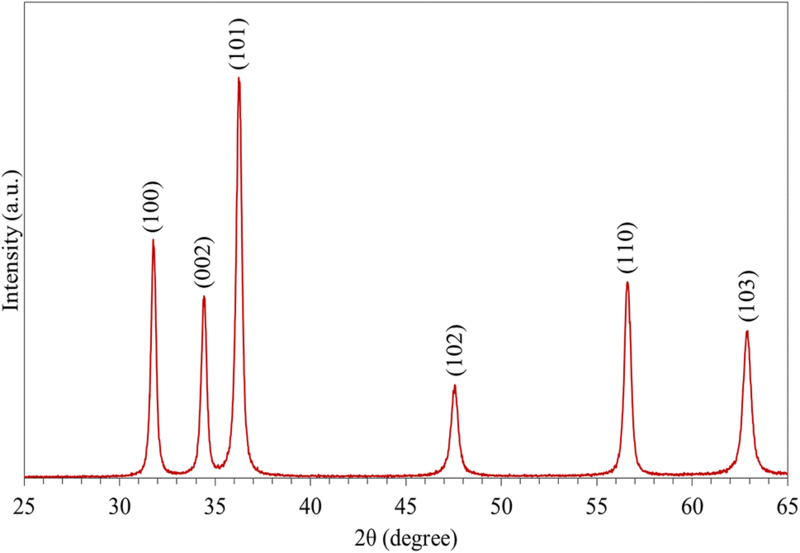 The band gap values for samples 1, 2, 3, 4, and 6 are 3.31, 3.27, 3.31, 3.29, and 3.32 eV, respectively, which reveals that the band gap value of the films is approximately the same and independent of synthesis condition (with considering the error range of calculation method). A study of PL property of ZnO is critical since it can provide more valuable information on the quality and purity of the materials. It is well known that there are emission bands in the UV and visible regions for ZnO crystals . Figure 4 shows the room temperature PL spectrum of the ZnO thin film. In PL spectrum, The ZnO porous thin film exhibits an emission peak around 380 nm in the UV region, which can be ascribed to the recombination of free excitons (called near band edge emission, NBE). The observation of the emission band that peaked at 380 nm is approximately equivalent to 3.3 eV, which is similar to the band gap of the ZnO (3.37 eV). The presence of this band is an indicator of the good crystallinity. The defects related to deep level emission, such as oxygen vacancies and Zn interstitials are responsible for visible emission which peaked at 490 nm. The structure of the novel stabilizer in this research is shown in Fig. 5. Among the four reactive amine groups, the two on the extremities will act as the primary amines. The two secondary amine groups in the middle are less active than the primary ones. High polarity of TETA is a consequence of long organic chains which increase the negative charge concentration on nitrogen. Furthermore, TETA is adsorbed to positively-charged surfaces of Zn complexes and stabilizes them due to the strong basicity. TETA possesses considerable hydrogen bonding that increases its boiling point and viscosity. Increasing of the sol viscosity may depress the diffusion of all ions in the solution and reduce the dielectric constant of the solution, which led to the formation of aggregated particles and larger size of crystalline ZnO. For high viscose sol, the crystal growth rate is also faster than nucleation rate resulting in porous morphology. As a result, slow rate of condensation in the sols and high thickness, small grain size, aggregated grain, and more porous structure in the calcined films would be conceivable. Since TETA can react with ionic compounds via amine ligand and combine with alcohols through ethylene chains, it can make stable, transparent sol and gel. High boiling temperature, hydrophilicity, and the emulsifying behavior of TETA lead to viscous sol after long aging time. It seems higher viscosity allows more rapid growth of the ZnO nuclei, resulting in larger particles and porous structure. 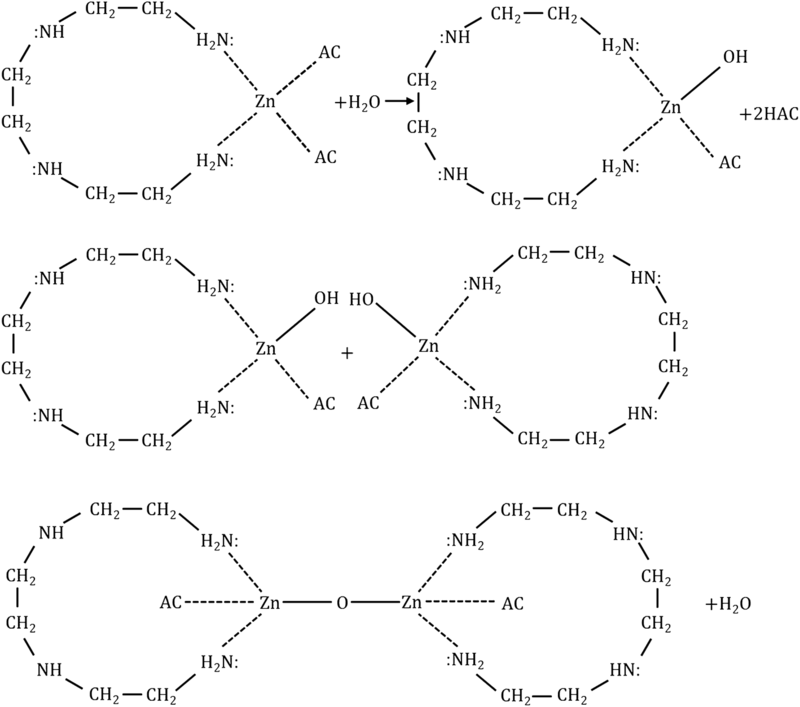 ZnO chains formed by TETA stabilized sol (with regards to its tetradentate chelating effect) are indicated in Fig. 6. TETA with its relatively high basicity and chelating ability helps along dissolution and hydrolysis of the precursor and provide developing pores in coated films. These unique porosities could be justified regarding TETA properties including hygroscopy and high vapor pressure that change the rate of evaporation and contraction of the film, and hence resulting in the formation of porous morphology. The common mechanism of crystal growth may be used to describe the formation of the spherical ZnO nanostructures. It is based on the aggregation of primary ZnO particles to form small spherical particles, which have a relatively larger size as compared to the primary species. Since small stable ZnO clusters are formed, they immediately merge to create the next most stable aggregate and so on. The primary aggregates would further rapidly combine to give the next most stable secondary aggregate. The observed ZnO clusters would be a result of rapid and continuous aggregation. Regarding the energy level, formed ZnO clusters tend to grow and react with each other through shrinkages in film preparation. The rate of particle growth is due to the high reactivity of TETA, which depends on the tetradentate chelating effect and long chain. In summary, we demonstrate a novel approach to fabricate spherical ZnO porous architectures by a simple sol–gel method and utilization of TETA as stabilizer without any template. Both microstructures analysis based on FESEM and optical characterizations show that the obtained films have a porous structure, appropriate crystallinity, and proper optical properties. The effects of solvent type, sol concentration, the molar ratio of TETA to ZAD, and withdrawal speed conditions on the porous morphology were studied and optimized conditions for the unique structure was achieved. The optimized sample was synthesized by EtOH solvent, 0.2 M sol concentration, molar ratio of [TETA]:[ZAD] = 2, and 30 mm/min withdrawal speed. Structure crystallinity, optical transparency, and the band gap of the porous films were investigated. Porous ZnO film shows a wurtzite structure with no preferred orientation. The band gap of porous ZnO thin films is calculated by Tauc model which is about 3.32 eV. The hierarchical porous ZnO film synthesized by the method introduced here can be utilized as an electrode in devices such as photocatalysis and photoelectrochemical water splitting. The authors thank Iran National Science Foundation for supporting this research under Grant Number 94002821.